NOTE: For your comfort and safety, special clothing items, including a wetsuit, are generally required Oct-May or during periods of inclement weather. If your trip takes place during a time period when wetsuits are required, see Wetsuit Information. Pets, expensive watch or jewelry, cell phone, or camera without water protection. Please note that storage of wallets, and other valuables is the participant's responsibility. On South Fork American overnight trips, we stay at campsites where your car is conveniently parked close to your site and bathrooms with hot showers, flush toilets, and electricity make your stay easy and comfortable. 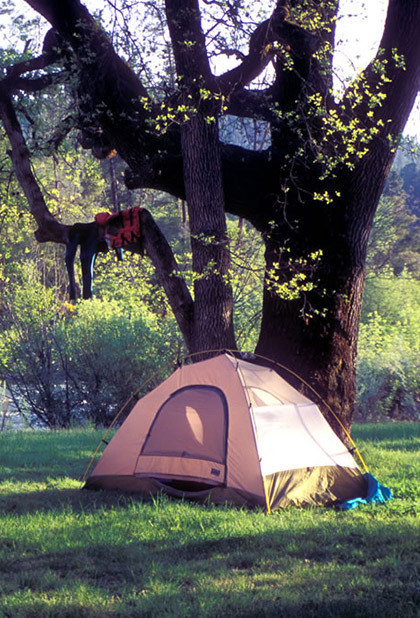 Therefore, you can bring as many items as you feel necessary for camping. Your river attire should be packed separately so you can change into it at the Meet Place or put-in.